Aude Sapere, Latin for 'dare to know.' Dedicated to the evaluation of news, media and politics. National Public Radio (NPR) represents a media organization thriving in the digital space to create and distribute news. Innovative uses of social media, their blog and linking themselves to their content producers and respected outlets, drive clicks to their website. NPR consists of a network of 900 independent stations and 27.5 million listeners a week. The organization is working to ensure a traditional form of communication, the radio, stays alive and well in the modern age with the savvy use of the newest form of communication – social media. Communicators across the United States bemoan the death of the “old media” due to social media tools such as Facebook, Twitter and bloggers. However, perhaps the “old media” would have a higher survival rate if the implemented strategic digital media to their services similar to NPR’s. Here are just a few ways NPR is utilizing social media to connect to their community – because in today’s world your audience interacts with you not just you to them. NPR’s website stands-in-attention as one of the most content filled websites I’ve ever been on. You could easily get lost for days perusing videos, photos or articles on a variety of topics. However, while you may get wander lust if you are constantly salivating to explore the next piece (like me), that is not to say it is a hard website to navigate. 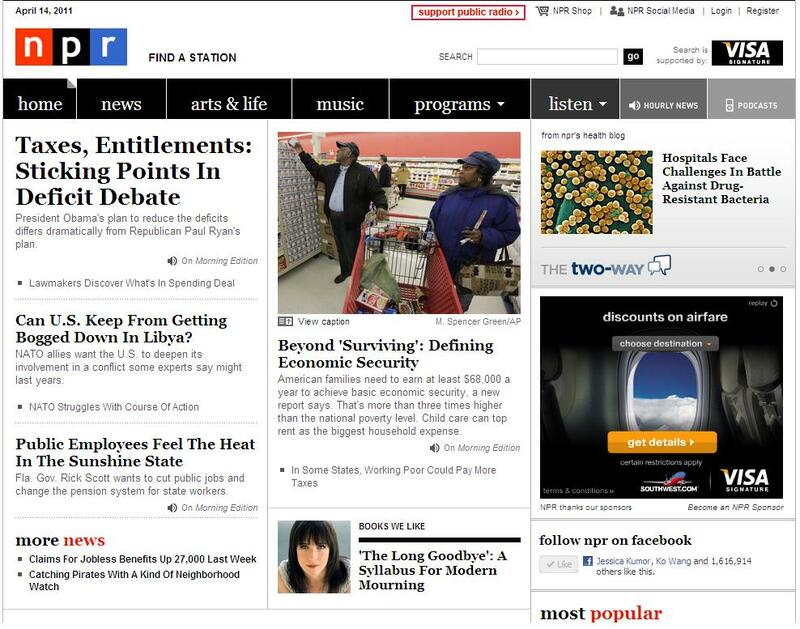 NPR’s design allows readers to interact with the content and follow the trail of bread crumbs of information around the site. Savvy tags and hyperlinks contribute to the ease of following a topics timeline of coverage. An intelligent move considering how much content is thrown on that website every hour. Wal-Mart owns a history of social media blunders spanning over a decade.While initial fopauxs are expected in social media spaces as their qualities are being defined, Wal-Mart seems to take the cake as one of the worst Fortune 500 Company’s presence on social media. Wal-Mart is not only a Fortune 500 Company but THE Fortune 500 Company, ranking in at number 1 in 2010, according to CNN.com. Their poor history overshadows any current strides – making Wal-Mart one of the number one companies wishing to purchase the “Last Night Never Happened” App to erase social media blunders. 2006 The Hub Social Network only lasts 10 Weeks – Wal-Mart’s attempt to compete with then giant MySpace where actors, models and famous for something people populated the space and pushed Wal-Mart products, according to SocialMediaReinvention.com. You may tilt your head in confusion upon first contact. Are they a jigsaw puzzle? A graphic mishap? An over pixellated image? Welcome to the age of the QR Code. Short for Quick Response, these codes add promise of a new and direct communication venue. A smartphone is required to use a QR Code. However, our growing obsession with our cell phones and the next and greatest in technology will certainly allow this slight hiccup to dissolve away in the next few years. Don’t we all have smartphones by now? One in two Americans will own a smartphone by Christmas 2011, according to Nielson. Guess I better get on the band wagon. Even I’m not on a smartphone – yet. Drat those pricey data plans. Download a QR Code scanning application to your smartphone. Find a QR Code in a magazine, on a billboard or merchandise. Open the scanning app and use your phone’s camera to focus the code on your screen. The QR scanning app will read the code and automatically open up the link, photo or video the code directed it to. An internet connection and smartphone are necessary. If you haven’t seen a QR Code yet, or don’t remember – be patient – you will soon. ***More on the subject later in a post on how/where/why QR Codes are growing in popularity. Enter your email address to subscribe to jkumor's blog and receive notifications of new posts by email. ©Jessica Kumor, 2011. Unauthorized use and/or duplication of this material without express and written permission from this blog’s author is strictly prohibited. Excerpts and links may be used, provided that full and clear credit is given to jkumor.com with appropriate and specific direction to the original content.